Habitat. In it's native range the Colorado Blue Spruce is found in small patches on river bottoms or in stands on north facing slopes. 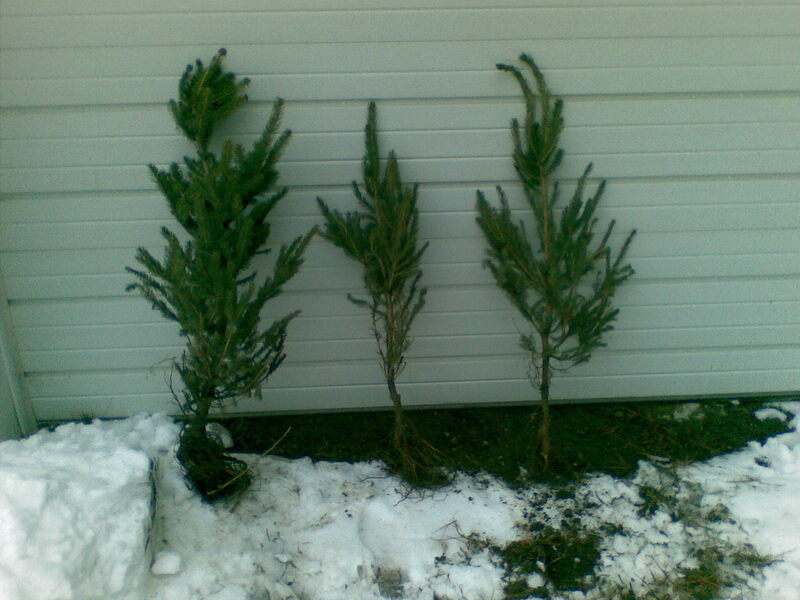 Blue spruce do not like standing water so make sure your site is not continually wet. The Colorado Blue Spruce prefers rich, moist soils but is adaptable to a variety of soil conditions including clay. It prefers full sun or partial sun and grows poorly in full shade. More drought tolerant than most spruce. Leaves. Needle colors run from deep blue to gray-green depending on the quantity of wax that covers them, with the brightest blue colors in the spring on new growth and as the older needles loose their wax they become greener. Sharp short needles are bunched on the upper side of the branch or curve up from the sides. The blue spruce needles are four sided, curved, almost square, 1/2 to 1 inch long. Care should be taken when handling blue spruce as the needles are very sharp and ones arms will look like you went and had acupuncture done on yourself. It is best to have a long sleeved sweater on while planting the larger trees. The Colorado Blue Spruce is easily identified because of it's sharp needles. Fruit. The spruce cones are cylindrical 2-4" long open in the first fall and falling off the next autumn. The cones are seldom a problem on blue spruce. Blue spruce cones are pale yellow-brown, scaly tips, narrow and wavy. Winter Buds. Are broadly conical.The Blue Spruce buds form at the end of the branch and also all the way down the branch which is why pruning is best done on Colorado Blue Spruce trees during dormant season. Bark. The bark of a blue spruce is brownish-grey and scaly. Pests. The Cooley Spruce gall aphid can cause major browning of the tips in the summer. If the Blue Spruce is small these can be picked off in the spring before the galls brown or a pesticide such as Sevin can be sprayed in the spring as the daytime temps reach 60 degrees. The spruce galls are very seldom a serious pest of the blue spruce. Rhizosphaera needlecast is a serious problem for the Christmas tree grower. The Colorado blue spruce is the primary host. Needlecast usually appears on the lower branches first as it is usually more damp on the lower part of the tree. It can if left untreated spread through much of the tree making it un salable. It can be treated by improving air circulation and applying a fungicide when the buds are 3/4" long and another treatment later in the summer. Do not prune in damp weather. Occasionally the White Pine weevil will kill the leader on a blue spruce. These can be cut off and burned in the spring as soon as wilting of the leader is noticed. Canker diseases caused by a fungus can be a severe problem. Distribution.The Colorado Blue Spruce was first discovered in the state of Colorado and it's native range runs from Idaho to Wyoming south to New Mexico and Arizona. Other. 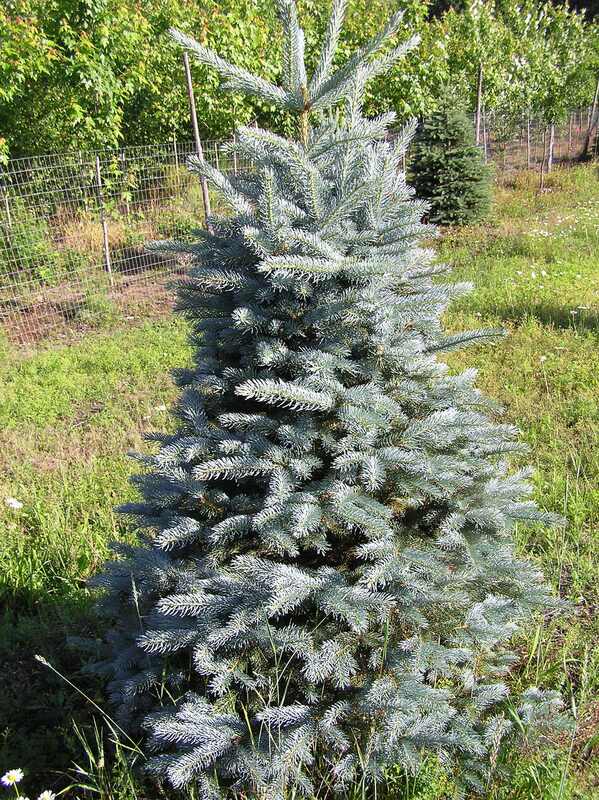 Blue Spruce is a majestic evergreen when planted as a specimen tree or as a group. Blue Spruce trees are widely planted across the country. The Colorado Blue Spruce survives ice storms well due to it's strong branching. The strong branches also make it ideal for a Christmas tree as it will hold ornaments well. Our live seedlings and transplants as well as the container blue spruce make ideal live Christmas trees. The branches on the Blue Spruce have somewhat of a layered look. Our Blue Spruce and Pine trees are grown from the finest seed available. Colorado Blue Spruce is the slowest growing of the spruce family, if you are looking for a fast growing spruce try the Norway spruce. There are many cultivars of the Colorado Blue Spruce trees one of which is Majestic Blue Spruce. The Majestic Colorado blue spruce seed are collected by a couple of Michigan men who secretly catch a plane wearing a disguise so no one will find their seedling source up in the mountains of Colorado. These tend to have a higher percentage of bright blue shiners than our regular Colorado blues do. 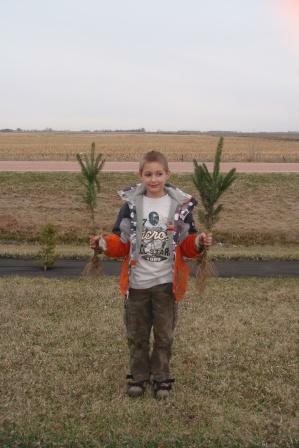 We sell Colorado Blue Spruce seedlings and larger trees. The blue spruce makes an ideal tree to be given out at arbor day or earth day celebrations and we have special pricing for the occasion. To buy a Colorado Blue Spruce seedlings or to check prices on other evergreens click the blue link below. Cultivars There are approximately 50 known cultivars. Fat Albert- A dense, upright pyramidal tree, nice blue green color, usually grows to 15'. 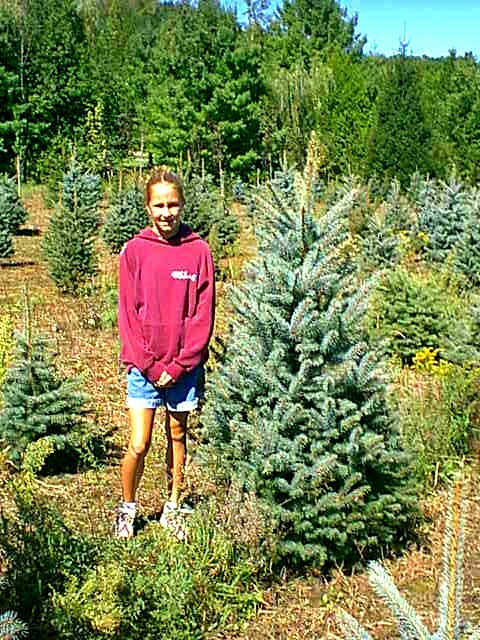 Hoopsii- Probably the bluest of the blue spruce, a relatively expensive tree as it is grafted, color is the most consistent. We have Blue Spruce up to 15'. Call for B+B prices. To order Blue Spruce seedlings by PHONE: We're glad to take your order by phone @ 231-544-6769 Phone orders can be charged to VISA or MasterCard accounts.